Keep it dry: Exhaust fans, windows, squeegees, etc. Also, keep the shower door or bathroom door open when your done so it can air out. Clean thoroughly: Before you can take any preventative measures, you’ll need to fully kill and remove the mold that has already formed. We suggest using borax, vinegar/baking soda or a high-pressure steamer (we can do this for you! Just ask!). See recipes below. Disinfect daily: As long as you don’t have sensitive natural stone like marble, granite or travertine, you can make a vinegar, water, essential oil spray to kill the bacteria each time you shower. Mix 4 ounces water and 4 ounces white vinegar in a spray bottle. Add 10-20 drops of tea tree or lavender essential oil for an extra boost. A few sprays in the corners, around the drain and on the floor should help prevent mold (NOTE: this won’t remove mold that has already formed!). If you have natural stone tile, you can leave out the vinegar and the essential oils will still help prevent mold. Get those commonly missed spots: Many plastic shower curtains can be machine washed or replaced cheaply. Towels and washcloths should be washed regularly and allowed to dry otherwise they can harbor bacteria when left too long. Don’t forget to look up; Mold can grow on the ceiling and walls too! Then, look down; Make sure to thoroughly clean the edges of the floor, around the tub, toilet. If any bacteria is left behind, it will continue to spread to other areas. Make sure to get it all the first time, then it will be easier to maintain! Remove the soap scum: Bacteria LOVES soap scum! To prevent it, switch from bar soap to liquid (more on that soon) or to remove it we suggest Mr. Clean Magic Erasers, Bon Ami powder cleanser or shampoo….that’s right, SHAMPOO! ( Also, Bounce dryer sheets work, if you’re into that). Mix all ingredients well. You can use this mixture by putting it in a spray bottle or a plastic cup and dipping a sponge in the mixture. Apply to any areas of mold (or all over). Let sit for 5-10 minutes, then scrub with the scouring side of the sponge or a firm brush. Rinse well. *NOTE: Check with your stone/tile manufacturer before using this on non-ceramic or fiberglass surfaces, such as marble, granite or other natural stone. How to you prevent mold in your bathroom? Leave your favorite tips in the comments below! Loosen microwave splatters. In a small, microwave-safe bowl or cup, stir together one part water and one part lemon juice (a couple tablespoons of each). Microwave the mixture on high for several minutes, letting the steam loosen any spots or stains. Then, wipe the inside of the microwave with a microfiber cloth. Clean and disinfect your kitchen naturally. Make a paste with salt and a couple of drops of lemon juice and scrub away. Disinfect a cutting board. 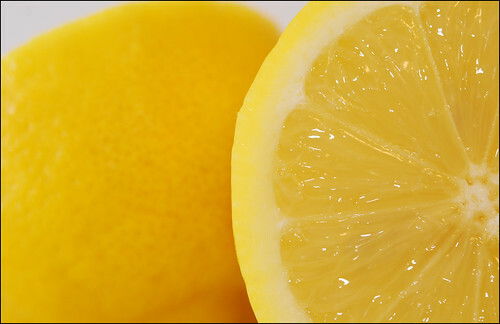 Sprinkle a little baking soda on your cutting board and rub the entire surface with a slice of lemon. This will kill germs and get rid of any bad odors. Keep ants out! Drip some lemon juice around windows, doorways, cracks and other places where ants might enter your house. The smell is too strong for the little guys so they stay away. Make an all-purpose cleaner. A paste of lemon juice and baking soda will clean and disinfect any non-porous surface in your home. Use it to clean your sink, stove, microwave, bathtub, faucet, counters and more! Freshen your kitchen sponge. Soak your sponge in lemon juice for a couple hours or overnight. Rinse well and use as usual. Freshen your garbage disposal. Grind up a few slices of lemon (or just the rind) in the disposal to clear away any foul smells. For extra freshening power, run extra hot water over the lemons before grinding them. Clear drains. Pour one cup of baking soda down your drain, followed by one cup of lemon juice. When the bubbling stops, pour in 4 cups of very hot water. Degrease surfaces. Rub lemon juice or a slice of lemon directly on the greasy spot. Remove ink stains from fabrics. Squirt a little lemon juice directly on the stain and let it sit for five minutes before washing regularly. Remove underarm stains from shirts. Mix one part lemon juice, one part white vinegar and two parts water. Soak shirts for one hour before washing regularly. Polish your furniture. Mix 2 parts olive oil and 1 part lemon juice and use it as a furniture polish.